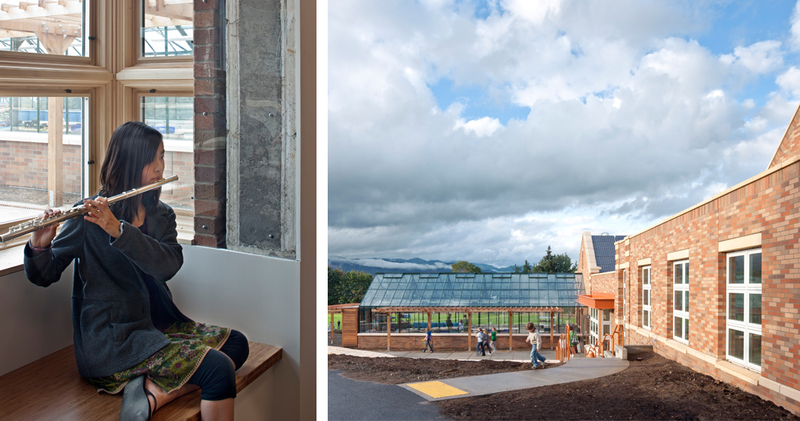 Hood River claims first ‘Net Zero Energy’ public school in the U.S. The music and science building at Hood River Middle School is the first public school building in the U.S. to earn net-zero status. Click through the gallery for more views of the school. Hood River Middle School’s music and science building has become the first public school building in the nation to earn the Living Future Institutes’s Net Zero Energy Building designation. The 2010 building replaced an older structure and previously earned the U.S. Green Building Council’s highest rating, LEED Platinum. The building earned net-zero status after demonstrating over a 12-month period that it produces as much energy as it uses. The building has a 35 kilowatt solar array that produces 35,000 kilowatt hours of energy a year. The building met additional criteria as well, including not blocking sunlight to neighboring buildings. Opsis Architecture LLP designed the project for Hood River. Interface Engineering provided mechanical, electrical, plumbing and energy analysis services. “What’s amazing about the Hood River Middle School project is that we were able to achieve Net Zero Energy with a 19.6 year economic payback on the added energy investments,” said Andy Frichtl, Interface managing principal. In January, Hood River Middle School announced it had marked its third consecutive year of creating more energy than it used — about one percent. The Business Journal’s Andy Giegerich reported on how instructors use the building’s green features to enhance how they teach math and science. See the original Sustainable Business Oregon article, here.